Over 80 British Car enthusiasts made their way to Abingdon Spares in Deep River for a tech session with internationally known British Carburetor authority Joe Curto. It was a tight fit but we managed to squeeze everyone in, with only a few standing! We even managed to get a few sports cars out of hibernation and into our parking lot! Joe provided a very interesting, informative and sometimes humorous two and a half hours of discussion on the famous SU carburetor. Joe began by describing the various types of SUs, starting with the H type (T-series) through the HIF (MGB) carbs. We are very pleased to announce that you can now get high-quality Just British logo patches. These embroidered cloth patches are the perfect way to customize your clothes, hat, maybe a tool bag, or who knows what else. These fantastic iron-on patches are approximately 2 inches by 4 inches. The patches are only $5 each, and shipping is free*. No matter how many you order, and you should order lots of them, the shipping is free within the US and Canada. If you need the patch shipped outside the US or Canada, just email us and we will work things out. Our Cars – Are They Vintage or Just Old? Did you ever think about the vintage of the cars you collect? Do they fall into a particular time frame? I was thinking about this today as I was cursing a job that I have done innumerable times before on different cars – refitting the plastic steering cowl. I realized that I had cursed this same job many times before. Then I realized that I had done so because most of my British car purchases fall within the time period of the 1970s – when British Leyland had a plastic fetish. During this same period, engineers had a preference for putting things in with screws where you would have to have three hands and stand on your head to replace them. Such were the 70s. Reader Russell Browne sent in these pictures from the recent Regent Street Motor Show. This show was held on November 4, 2017, on Regent Street in London from Piccadilly Circus to Oxford Circus. VotW – MGB Review! 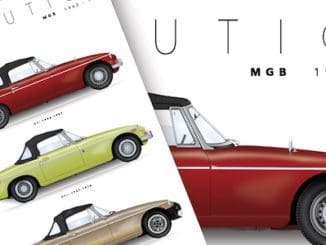 – Are All MG’s Unreliable? Loving this one. Our video this week is from our friend John Clancy who brings you TriumphDVDs. But, this week’s video is not about Triumphs. No, this week we are looking at the history of Rover. Rover is one of those brands that was never very popular here in the US but was a standard in England. Additionally, the Rover brand was had heavy influences on almost all other British car brands and contributed one of the most famous engines of the classic period – the Rover 3500 V8. This video is a preview of the documentary DVD charting the full story of Rover from the introduction of the safety bicycle in 1895 to the last cars in 2005.